Have you heard of Ecological Flows? Our fisheries researchers are world-class scientists. They conduct cutting-edge research to provide fisheries resource managers the scientific information they need to protect, restore, and enhance our Nation’s fisheries and their habitats. Forty percent of all fish species in North America are at risk of extinction. USGS research is crucial to protect and manage at-risk species and healthy fish populations into the future. As part of the USGS Fisheries program, ecological flows, or the relationships between quality, quantity, and timing of water flows and ecological response of aquatic biota and ecosystems; and related ecosystem services are being investigated. USGS scientists study life history, population ecology, and conservation and restoration strategies for aquatic species and the habitats that sustain them. The water in the Delta arrives primarily from the Sacramento and San Joaquin Rivers, supplying water for more than 22 million people. This water source supports California’s trillion-dollar economy—the sixth largest in the world—and its $27 billion agricultural industry. A new USGS study shows non-native Brown Trout can place a burden on native Brook Trout under the increased water temperatures climate change can cause. Studies on the aquatic food web, tree swallows, and the spread of contaminants take center stage at SETAC 2016. 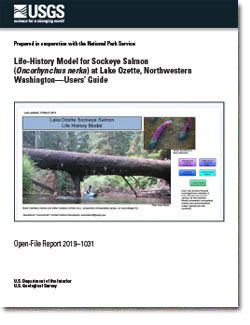 Woodward, A., Haggerty, M., and Crain, P., 2019, Life-history model for sockeye salmon (Oncorhynchus nerka) at Lake Ozette, northwestern Washington—Users' guide: U.S. Geological Survey Open-File Report 2019-1031, 79 p., https://doi.org/10.3133/ofr20191031. Hemingway, Rulon J.; Tiffan, Kenneth F.; Erhardt, John M.; Rhodes, Tobyn N.; Bickford, Brad K.
We report here the genome sequences of two index strains of Pacific salmon paramyxovirus isolated in 1982 and 1983 from adult salmon in Oregon. The isolates are most closely related to Atlantic salmon paramyxovirus, the type species of the genus Aquaparamyxovirus, but are sufficiently distinct to be considered two genotypes of a novel species. Winton, James; Batts, William N.; Powers, Rachel L.; Purcell, Maureen K.